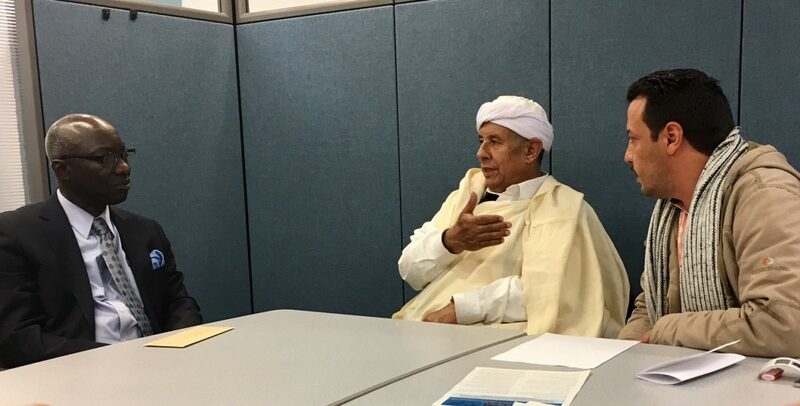 Libyan tribal and women leaders met with the United Nations and U.S. State Department officials to discuss the urgent need to include women, tribes and traditional leaders in the Libyan peace process. New York and Washington. 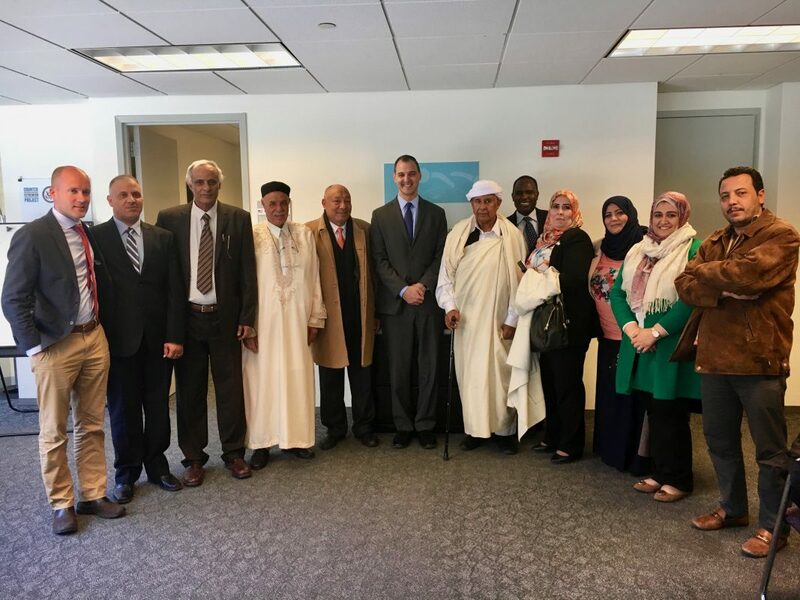 The Network for Religious and Traditional Peacemakers and the Libyan Institute for Advanced Studies organized the visit of three women peacemakers and six tribal leaders to the United States on the 12th to the 18th of March. The visit was part of the work the Peacemakers Network does in Libya in order to support Libyan communities in finding a path to sustainable peace. Libya has been in the state of instability and in an ever-growing risk of full-fledged civil war since the ousting of Colonel Muammar Gaddafi in 2011. The delegation’s visit began in New York, where strategic meetings were held with the United Nations Support Mission in Libya, the United Nations Development Program, representatives from the United Nations Security Council and the Senior Advisor for the Prevention of Genocide, Adama Dieng. Aside from representing Libyan women and tribal leaders, the delegation members represented the National Movement, an organization of tribal leaders that advances grassroots reconciliation. Within the organization, many Libyans have been able to reconcile despite political differences, and the Movement now aims to grow its influence in order to stabilize Libya through the guidance of local tribes. The delegation also highlighted the significant role women have made, and continue to make, in reconciliation efforts. “Libyan soil is covered in Libyan blood,” said Sheik Faraj, president of the National Movement. The delegation urged the UN to cease their support of the current Libyan government, which, according to the delegation, does not represent the majority of Libyans nor acknowledge the legitimacy of traditional leaders. The delegation requested the UN to acknowledge the National Movement as a legitimate representation of Libyan people. “This movement highlights the common between Libyans, rather than the differences” said Ms. Nour Alobeidi, emphasizing the importance of making Libya a state that includes everyone. During the meetings, UN officials heard about ongoing tribal reconciliation processes, and women-led ceasefires and peace agreements throughout Libya. “We’ve proven that we can make peace,” said Ms. Amal Alhaaj when giving examples of the concrete steps women have taken to build peace. One objective that has unified these women over opposing tribal lines has been sharing in their common grief caused by war. “We created Networks in the south of Libya for women from different tribes to unite under one tent,” explained Ms. Thuraya Rathman. The tent became a meeting place for women and a safe space for sharing the pain of the price of lost family members. The tent had a decisive impact for many women to choose not to send their children back to war. The delegation continued their visits in Washington D.C. where they took part in a roundtable discussion with the State Department, U.S. Institute for Peace, USAID and the Department of Homeland Security. During these meetings the delegation was able to share the successes of their movement and highlight the need for recognition and support from the international community. During their time in Washington, the delegation participated in a workshop for gender inclusivity and were able to discuss strategic next steps with members of the Network Secretariate and also with Katherine Marshall, senior fellow at Berkley Center for Religion, Peace, and World Affairs. The final reception for the delegation was co-hosted by the Shoulder to Shoulder campaign and opened by Dr. Syeed from the Islamic Society of North America. “Libya is sick and in need of urgent care” said Sheik Faraj. The tribal and women leaders returned to Libya with hopes for further collaboration with the UN and support from the international community.